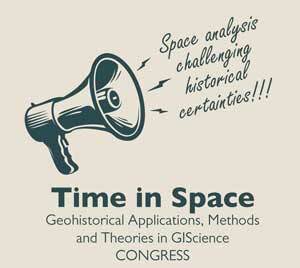 The International Conference Time in Space, Geohistorical Applications, Methods and Theories in GIScience aims at creating a space for dialogue between researchers and to address new challenges in the field of GIScience analysis and representation of historical data-sets. The Conference and the Scientific Committee welcome original papers of either practical or theoretical nature, research results or applications in one the Conference Thematic Areas. Each author can participate with one presentation. In order to guarantee neutrality and peer review evaluation of the process all the proposals (350 words or 2200 characters) will be handled through the Conference abstract submission form. Conference proceedings will be published as a special volume by spring 2020. Download the «Call for Papers» Poster. Space has always been a focus of research engaged in the study of historical processes. Yet, their attention has fluctuated over time with different levels of interest over the years. If time tends to represent a major focus to historical analyses and space figures a more geographic approach, Historical GIS represents a cognitive and intellectual device that integrates both perspectives. The goal of this session is to create an opportunity for researchers engaged in this multidisciplinary approach the exchange new ideas and concepts about Historical GIS methods and theories. GIScience, already applied in disciplines such as archeology, architecture history or museum management, revealed its extraordinary potentiality as a tool for managing cultural heritage datasets. GIScience has demonstrated itself also as a relative challenging application in conservative practices. The proliferation of preservation initiatives of cultural heritage, in the face of the continuous threats caused by the advance of modern society, has found in GIS applications an instrument of great efficacy. Increasingly, architects, archaeologists, curators, and policymakers are using new digital cartography tools as devices in their effort to facilitate the recognition and even the digital reconstruction of heritage. Institutions and researchers ale also using geographic applications to deliver more complex sets of information to colleagues, end users and tourists. This process has manifested itself not only in individual researchers but also noticeable in the creation of advanced collective cartographic systems for the management of these projects. Within the historical geography studies, the introduction of GIS software has been a sort of revolution: first, GIS software allows maps and aerial photos to be georeferenced and vectorised; second, it allows to create historical geodatabase using other kind of sources, such as texts. Actually, it now represent one of the most widespread methods to display and compare diachronically and synchronically different sources with a quantitative analysis. This panel aims to reflect on problems and potentialities linked with this methods, focusing on (but not limited to) themes as sources treatment and criticism, georeferencing and vectorisation process, “metasource” analysis, applications in research and in heritage/landscape management. From the second half of the forties of the 20th century, contemporary scholars started to develop a more sophisticated approach to data architecture. With the diffusion of personal computers, bigger databases and more advanced analytical tools were developed to process and uncover the patterns hidden in this significative vast amount of information. This section aims to dialogue about the state of the art in spatial analysis applications applied to the study of changes and evolution of historical phaenomena. Geographic information system technologies provide unique opportunities for instructors and academics to engage their students with real research data. The visual nature of GIS information gives students the opportunity to interact with and manipulate these data sets, thereby helping them to understand in a more insightful way concepts and meaning of geographical subjects. The use of geographic visualizations to explore Humanities subjects in the classroom has the potential to engage students in a more comprehensive way students. This session aims to develop a discussion on how GIScience is changing education in human sciences. New technologies and the evolution of GISciences have allowed the transformation of representation and visualization of spatial data and georeferenced information. Data visualization has become a critical aspect in the field of representation of transformation and changes from a historical perspective. Thus, the representation of spatial data acquires an increasingly important role in the dynamics of communication and scientific research. In most human sciences a wide epistemological gap seems to persist towards GISciences. This lack of mature epistemics appear associated to an absence of an intellectual analysis and thought about GIS and the history of these revolutionary technologies. The main focus of this session is to analyse ways in which GIS technologies has changed the history of cartography during the last three decades.